Poised and ready to pounce, this detailed Tyrannosaurus Rex Lamp is lit from within by a warm white LED giving his belly a warm, comforting glow. Bed time will become your child's favourite time as this very cool lamp sits at their bedside giving the reassurance of light as it shines in the night. 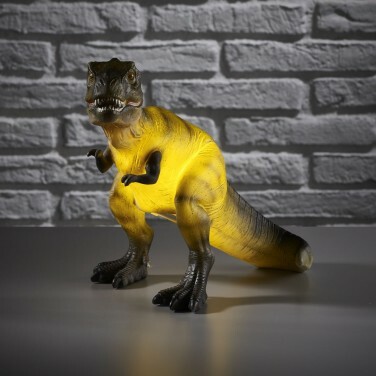 Battery operated, this light up T-Rex can be placed anywhere in their room and remains cool to the touch.